Then again, you could always Google images meeting your criteria. Good luck with your endeavors!!! If you can track down Joe Tedesco, he has thousands of pictures. I am sure he has a web site. They used a scrap of romex for cable support. Looks unprofessional, but one could argue that the romex scrap is gentler on the wire (in that it's less likely to damage its insulation). Good pictures but I'm still looking. Have you have one of thoses fist impression of "nice job" moments then you see something majorly wrong? Or you look at a rats nest to find out outside of workmen ship, you don't find anything wrong with it? 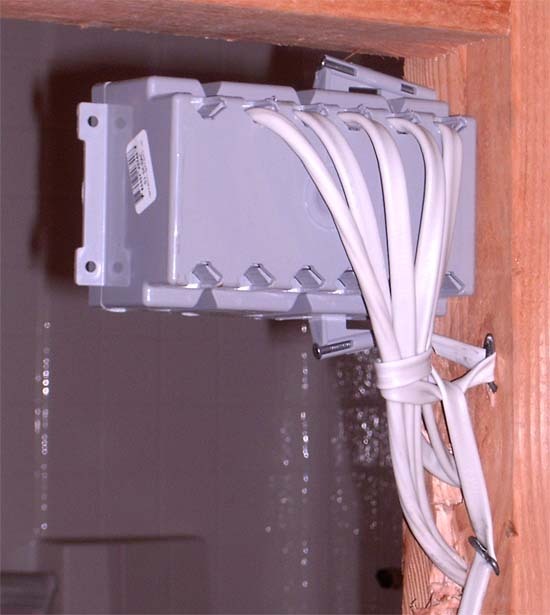 I would say the NM conductors coming behind the 3 gang box does not meet code, 300.4(D) have some photos of some houses where "EC" would never enter any box from the bottom, every one had the cables enter the top, but the wiring was poorly done & of course passed inspection. Due to the garbage electrical work & the references to "110" & "220" volts, I called them a DIY'er with a C10 contractors lic. I don't know if it's still that way, but Joe "owns" (copyrights) all the images (even if they're sent to him by other people). Old Joe seems to be in the wind. His web address is up for sale.